One lunchtime, while sitting in my office in Santo Domingo and browsing facebook I saw a competition being run by Schuh and UGG called “Make A Wish”. You just had to click on the link, enter your details and then choose your dream destination and your favourite pair of UGGs. I never thought I’d win but I went for it anyway, choosing Istanbul as my choice of a weekend escape and a pair of Bailey UGG boots. Two weeks later I received an email that said “Congratulations, you’ve won a weekend in Istanbul and a pair of UGG boots!”. I couldn’t believe it! 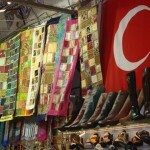 I’d actually won a weekend trip to Istanbul and a pair of UGG boots! I replied and the lady at UGG UK kindly organised everything, sending my gorgeous boots to my home address and arranging the trip to Istanbul for me and my boyfriend. We booked it for a few months later and in September we were leaving London Heathrow and heading to Istanbul! Before I go on to talking about Istanbul, I have to say that these boots are the most comfortable and cosy boots I have ever owned. I’ve had similar ones before but never original UGG boots and, wow, there is a difference! They are so unbelievably warm, I wore them non stop last winter and can’t wait to get them out again this year! I think they will last well too but when they do get worn out I will definitely replace them with another pair! 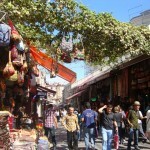 I chose Istanbul as it was a city that had been on my travel wish list for a very long time. 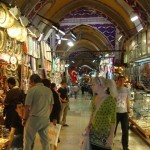 I had always wanted to see the Blue Mosque and spend a day shopping in the Grand Bazaar and I wasn’t disappointed when I arrived. A car was waiting for us at Ataturk airport and we set off for our hotel at about 6pm. It was a Friday evening and there was a lot of traffic meaning the journey took around one and a half hours (without traffic it would be 20 minutes). Our driver weaved in and out of narrow streets to try and avoid the traffic and as he did I was glued to the window, trying to take in as much as possible as we passed by small shops and houses. I saw men making leather shoes in tiny little workshops, the windows were lined with so many pairs and I couldn’t wait to go and take a closer look. We arrived at our hotel, The Best Western President Hotel which was in a great location, just a few minutes walking distance to the main streets. After a quick freshen up we went straight to dinner, we didn’t have a place in mind but we just started walking and found ourselves in the middle of a bustling street full of restaurants. There was loud music playing and people clapping and dancing, we didn’t hesitate and chose one of the busiest places as soon as we spotted a free table. 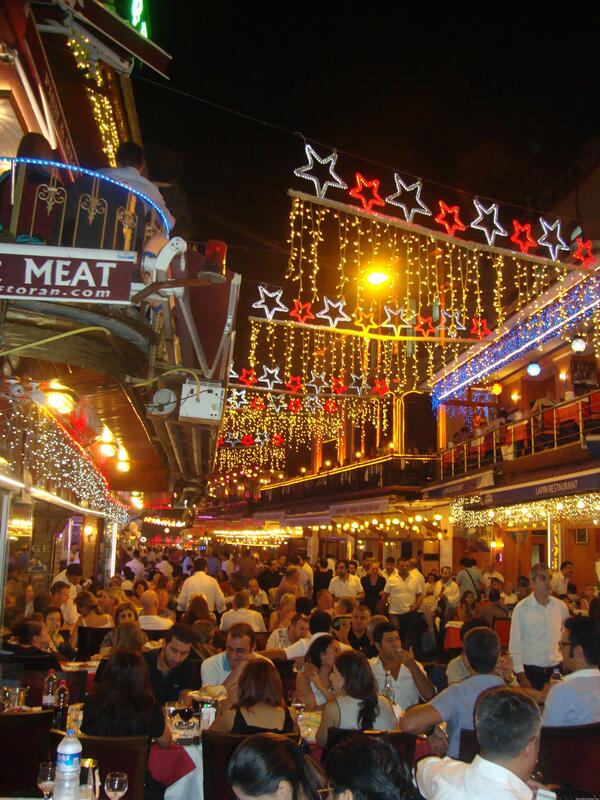 Dinner was nice, traditional Turkish kebabs and salad with local beer and cost around 20 Euros for two people. We enjoyed the atmosphere for a couple of hours and then headed back to the hotel as I wanted to wake up early and enjoy a full day of exploring! 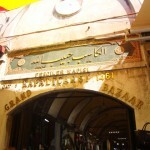 I had been waiting to visit the Grand Bazaar since the first time I had heard about it many years ago and I was like a kid in a sweet shop when we arrived. The place is even bigger than I imagined and you can buy everything here. 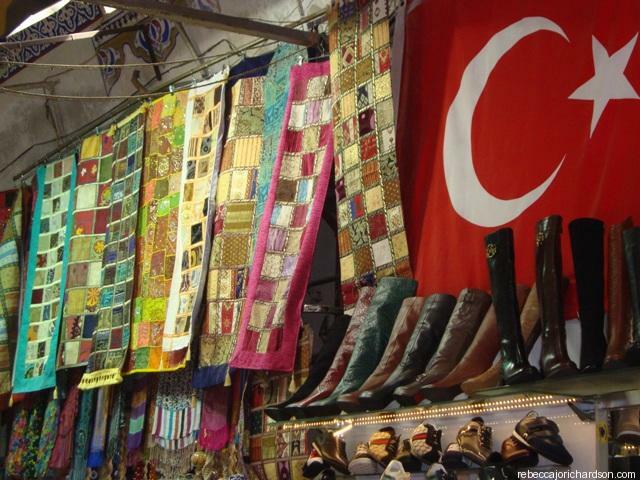 I started looking at leather handbags and shoes and then scarves and jewellery and souvenirs and sweets … it was shopping heaven. 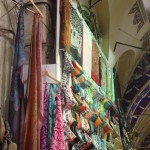 You have to negotiate the prices and haggle a little but I didn’t find it too difficult here. 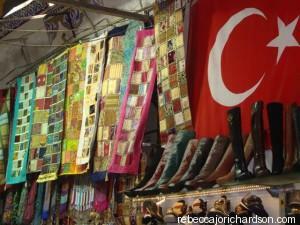 It’s more modern than Marrakech and the prices start quite close to what you would expect to pay. Usually I have a price in my mind of what I would be happy to pay for each item and just aim for that, if the seller doesn’t agree then I move on as you are almost guaranteed to find the same items in the shop next door. 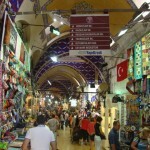 You can easily spend a whole day here and depending on your budget you can come away with a lot of beautiful things. It’s quite tiring though and for me the perfect way to end the day was to sit down with some Turkish tea and Shisha in a street cafe and enjoy the rest of the evening just relaxing. 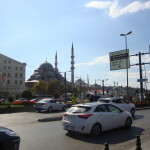 My second day was dedicated to sight seeing and I started, of course, with the famous Blue Mosque. 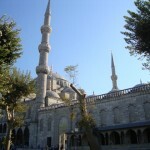 The correct name, I learned, is in fact The Sultan Ahmed Mosque and it was built in 1616. Seeing the Mosque was another wish of mine and I was so pleased that we were allowed to go inside and see all its beauty. The Mosque is still used by many people for worship so there are areas dedicated for tourists and of course you must be respectful and cover up and remove your shoes before you enter. Inside you will see the walls are lined with beautiful blue ceramic tiles, these tiles are the reason for the name Blue Mosque. 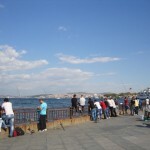 Next I wanted to cross the bridge that was busy with fisherman and see more of the old town. 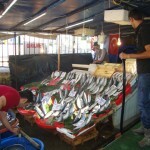 First we passed through an incredible fish market and then we walked up very steep cobbled streets. At the top of the hill we reached the Galata Tower, another famous landmark in Istanbul and opposite was a Lavazza coffee shop which seemed like a good place to stop and recharge with a cappuccino before heading back to the hotel. 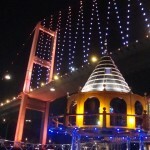 Another gift from UGG was a dinner cruise on the Bosphorus and at 7pm we were collected and taken to the docks. Our boat was waiting and when we boarded we were greeted with wine and music. A short while later and the cruise began. We ate and enjoyed the views and after dinner we went to the deck to watch some local entertainment. There was lots of music and dancing and everyone, young and old, were enjoying it. 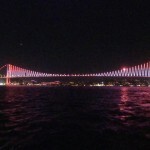 We passed under the very impressive Bosphorus bridge which lit up the night sky with it’s bright colourful lights. 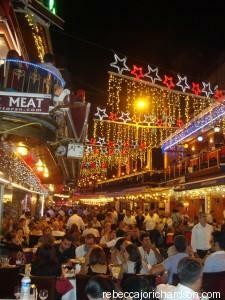 At around midnight we had reached the shore and sadly the party, and our trip to Istanbul was coming to an end. It had been perfect and I was so grateful that I had won this trip and that another one of my travel dreams had come true. Now on to the next wish! Sign up to follow my journey!